Here are some of the dogs that contributed significant bloodlines to our kennel. Most were also important members of the family and all were good friends. Cloey was a beautiful large black and tan female and was my son best friend for 13 years. Lady was a black and red female Shepherd. She was my loyal friend and protector for our family for 12 years and will always hold a special place in my heart.. She adapted well to all situations. Her bloodline is mostly German. 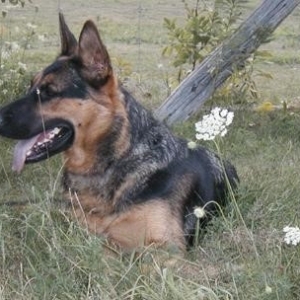 She has been trained in obedience, agility, tracking and personal protection. 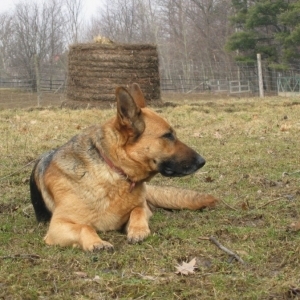 Her puppies exhibit her stable personality and confidence. 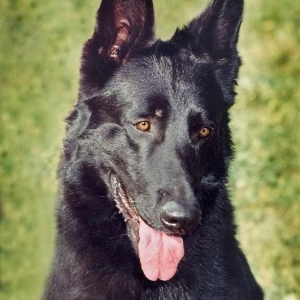 Jafar is a large all black purebred male German Shepherds Dog from an American bloodline (pedigree), his sire was Am/Can Select Champion. He has an excellent temperament; he is very calm and intelligent. 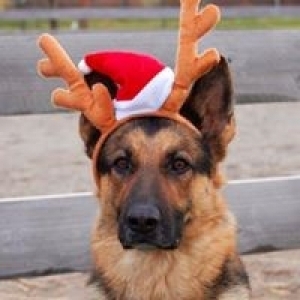 He has sired many litters of pups, which have grown into large healthy German Shepherd dogs that process his wonderful temperament. 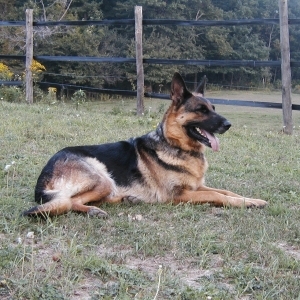 Jafar is trained in agility and obedience and lives most of the time with my sister on her family farm.s. 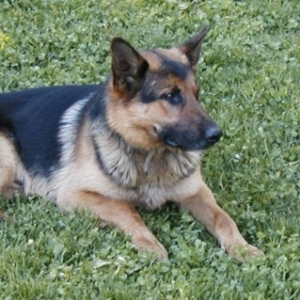 Portor is a large 6 year old black and tan male. He has calm, friendly nature and enjoys being with people. He learns quickly and adapts well to new situations. 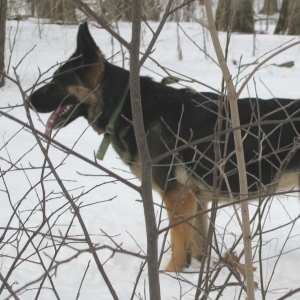 Porter is obedience trained and trained in tracking. 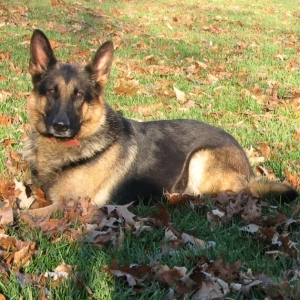 GoodHearts Shelby is a beautifully black and tan Shepherd. Her parents are Cloey and Bryson. She was best friends to my younger son Brendon. The only time she was not by his side is when she was having pups and even then she tried to stay close by having them in his bed. Sullivan was a bi-black shepherd. Sullivan was a very calm, relaxed fellow that enjoyed being with people. 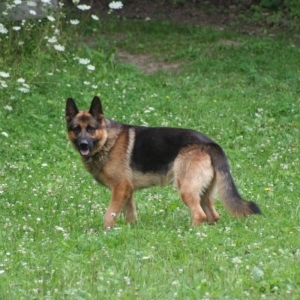 Nikayda is a black and tan female. She is an average sized female shepherd. 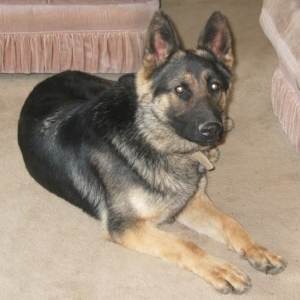 Nicky has basic obedience training and some agility training. She loves to play with the other dogs and enjoys just hanging out with me when I do the farm chores. 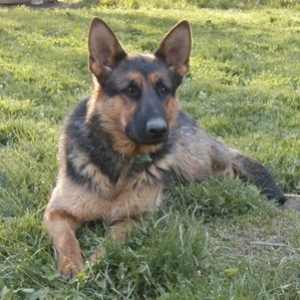 Her parents are Abbey(now retired) and her father is Bryson, one of our male stud dogs. Both Abbey and Bryson's picture can be found on this web page. 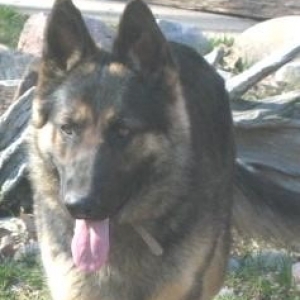 Morgan is a black and tan female German Shepherd dog. She is the daughter of Lady and Bryson as well as the full sister of Missy. Her bloodline is mostly German. Morgan, like her parents, has the straighter back of a working dog. Morgan is trained in obedience, agility and has started tracking. She is well socialized and loves the companionship of people. Barons Parents are Byson and Cloey. 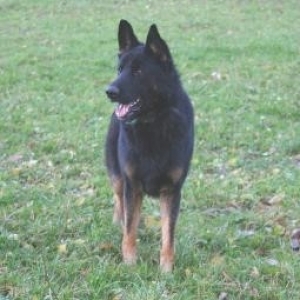 He is a large black and red male with an extremely calm temperament. He jus loves attention an pet. 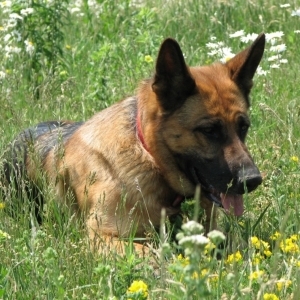 Nia is a black and tan female shepherd. She is a daughter of Jafar and the grand-daughter of Lady Allan. She has an outgoing and friendly nature. She loves going with up to catch the horses and having a good run in the fields. Nia has been trained in obediance, tracking and agility. Missy is a female black and red purebred German Shepherd. She is the daughter of Lady and Bryson as well as the full sister of Morgan. Her bloodline is mostly German. Missy, like her parents, has the straighter back of a working dog. She is well socialized and is an excellent companion dog. 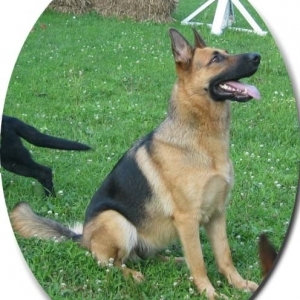 She has her parent’s stable temperament and is trained in obedience and agility. 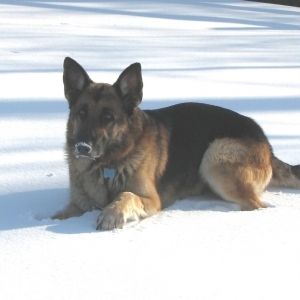 Missy is an excellent example of the diversified German Shepherd dog. Rose parents were Lady Allen and Bradens Storm.